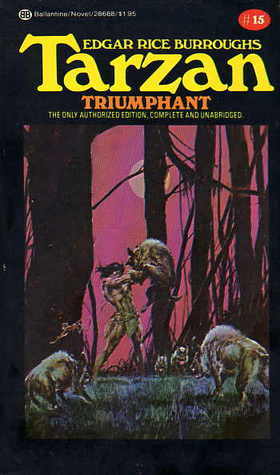 Of all of the later Tarzan books, this is my favorite. I remembered Gunner and his machine gun long after the rest of the details were lost in the fog of time. This is one of the rare Tarzan books that is genuinely funny. Gunner and his "kid" are such a wonderful couple and I thought it was clever of Edgar Rice Burroughs to bring in someone less than perfect for Jezebel. As worried as ERB was about genetics, he would never have matched up an upstanding, pinnacle of nobility with someone with such a horribly flawed genetic heritage. And that brings up a controversial point. I love Edgar Rice Burroughs' stories and his imagination was literally boundless, but he also had some pretty weird hangups about genes and even advocated some awful policies based on eugenics. I'm glad that I was able to love Tarzan and his world decades before I knew the more unsavory parts of his creator's beliefs. I've already touched on the racism and sexism in his books - truly awful - but the genetic stuff is just as bad if not worse. What do you do when something you love is created by a flawed human being? Can you separate the art from the artist? I can, mostly because I was lucky enough to encounter Tarzan without that baggage and I was savvy enough to reject the racism and sexism even as a young teenager. But, learning these things about ERB later did taint some of his writing for me. It's a little like the Cosby Show, can you watch it and enjoy the stories on the screen without thinking about the unforgivable behavior being perpetrated off-screen? I think it's something you can only resolve for yourself - for me, I can still love Tarzan but I can't imagine listening to Noah or watching Fat Albert ever again. Some things are just too much to forgive. All of that being said, and I know I've strayed far from the point - I love this book and I had a lot of fun revisiting it. My biggest complaint, and it's common for the later books, is Tarzan is less of a character and more of a force of nature. I miss the days when he was caught between two worlds - that's the Tarzan I want to spend time with - not just the superman/demigod swinging through the jungle, saving stupid white people.